Buttermere the lake a beautiful lake from which Buttermere village takes its name is about 1¼ miles long by about ¼ of a mile wide and 75 feet deep lying at the head of the valley of the River Cocker. Buttermere village stands at the north western end of the lake and beyond this lies the just as beautiful Crummock Water and beyond that, to the north, there is another lake called Loweswater. Crummock Water owned by the National Trust is about 2½ miles long by ¾ of a mile wide and 140 feet deep, has six small islands and is dominated by the hill of Mellbreak which runs the full length of the lake on its western side. The River Cocker flows northwards from Crummock Water into the Lorton Vale. There is a footpath around both lakes. Haystacks at 597m (1958ft) situated at the southern end of Buttermere Lake has become one of the most popular fells in the area due to Alfred Wainwright’s description and attraction to the fell. The summit sits on a short rocky spine set at right angles to the ridge. Both ends of the ridge have cairns but the northern end is accepted as the summit. The view from the summit of Gable Crag on Great Gable, Ennerdale Water, High Crag, Crummock Water, Buttermere and Buttermere lake is stunning. The interesting summit of Haystacks contains a number of attractive rock formations and tarns. The highest tarn just below the top is known as the summit tarn but officially unnamed. Innominate Tarn formerly known as Loaf Tarn is a small tarn situated at 520m close to the summit and it is here Alfred Wainwright chose to have his ashes scattered. The larger Blackbeck Tarn situated at 486m (1600ft), just below Innominate Tarn, is a glacial tarn with rocky outcrops and grassy patches clad with heather and bracken. Its outflow is Black Beck which flows down through a cleft between Haystacks and Green Crag then tumbles nearly 1000 feet into Warnscale Beck. 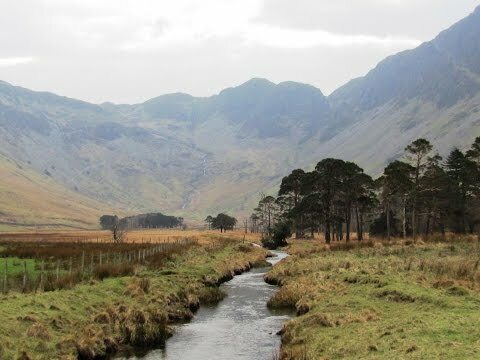 Warnscale Beck rises on Grey Knotts and flows down in a north westerly direction into Warnscale Bottom and to its confluence with Buttermere Lake. From the car park we cross over the road and take the footpath through the gate on the left of the bridge and the post box. We head forwards following the track with Buttermere the lake on our right. We cross over a bridge and go through a gate then head uphill to the right of a small triangular wood. At the top of the wood we turn left and keep following the path steadily uphill with a fence then a wall on our left. We eventually walk along Scarth Gap Pass and then start bearing left steeply uphill to Haystacks clambering up and over some rocky outcrops on the way. At the top we keep heading forwards up and down and over the rocky tops following the cairns and after passing a small tarn we make our way down to Innominate Tarn. We follow the path with the tarn on our right and continue forwards to Blackbeck Tarn. We cross over the stream and bear left uphill then after a short way we turn right uphill. We keep following the path towards the mine workings in the distance. When the path bears sharply round to the left we keep heading towards the mine workings. We cross over Warnscale Beck and turn left following the beck downhill. As we head downhill following the cairns we admire the waterfalls. At the bottom we come to a track and we just follow this back to the Gatesgarth Farm and the car park. This is a hard walk on mainly good paths and tracks with steep inclines and declines. There are some steep rocky outcrops to scramble up between Scarth Gap Pass and the summit of Haystacks. Elevation: Approx lowest point 104.5m (342.5ft) approx highest point 591.1m (1939.3ft). Approx 4.5 miles allow 2½ to 3½ hours using OS Explorer Map OL4, The English Lakes North-western area. Start point: Gatesgarth Farm car park. From the A66 take the B5292 Braithwaite. On entering Braithwaite take the first left then bear left and follow this road and the signs for Buttermere. On reaching the t-junction at Buttermere turn left following the road B5289 to the far end of Buttermere Lake and Gatesgarth Farm car park is about ½ mile further on just on the left. Parking: Gatesgarth pay and display car park £4 for all day. There are no public toilets or refreshments the nearest facilities are in Buttermere village, Keswick and Cockermouth.